I do love a bit of vintage. Even before it got trendy to do so. Perhaps it came from being dragged reluctantly around Antique Shops throughout my childhood whilst being constantly told not to touch anything?! So when I was invited to the Launch Party for Candy Belle's Vintique Boutique with retro snacks, cocktails and vintage shopping I got a little bit excited! With BFF in tow we donned our glad rags and lippy and prepared to party vintage stylee. What a nostalgic spread! Party rings, cheese straws, drumstick lollies, skips crisps, frazzles, space raiders, cheese straws and cheesy wotsits. Sputnik like cocktail hedgehogs with cheese, pineapple, pickled onions and sausages transported you straight back to a 70's childhood. Even the drinks were retro with Creamola Foam and Babycham alongside the cocktails. BFF made an instant beeline for the Pineapple Ice bucket and is now its proud new owner! I purchased some gorgeous floral mugs and a 70's cropped blouse but I was so tempted by many other goodies on offer especially some of the picnic ware. They really knew how to picnic with style in the 60's and 70's. Even the Great British Bake off went vintage last week and I bet there's been a rush on Rum Baba tins in cookery shops up and down the country! I'd happily let Silver Fox Mr Hollywood scrutinise my Babas... But enough of the innuendo. 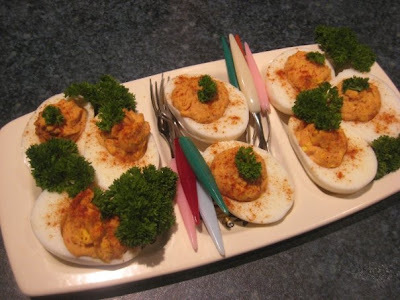 Here's my own attempt at retro canapés made for a 70's soiree a la Abigails Party. 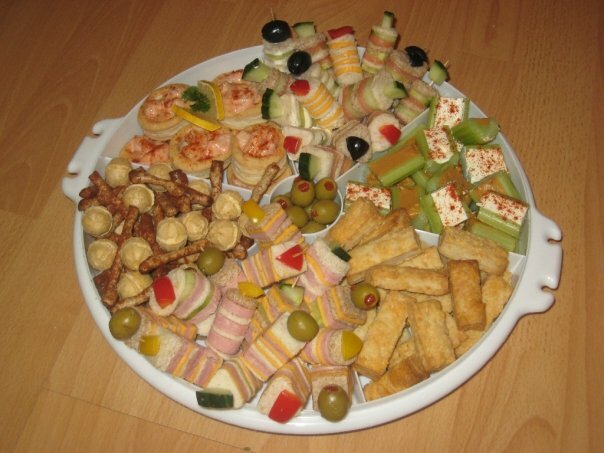 Served in a genuine Tupperware Party Susan they are - Prawn Vol Au Vents, Classy Canapes, Peanut Butter Celery, Cream Cheese Celery, Cheese Straws, Twiglets & Cheeseballs. 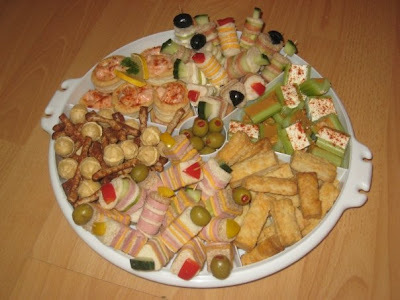 The "Classy Canapes" are fantastic in themselves made with an amazing piece of kit that I got on ebay. The rest of the menu for our 70's party comprised of Devilled Eggs, Prawn Cocktail, Chicken Kiev, Scampi in a Basket , Smash, Sherry Trifle (with Dream Topping and Hundreds and Thousands) and Black Forrest Gateaux. All washed down with the obligatory Babycham, Blue Nun and Mateus Rose. Quality! Candy Belle's Pop Up shop is in The Academy Shopping centre for this weekend only. Saturday 9.30am - 6pm and Sunday 12noon - 6pm. Do drop in and visit her in her weekend home. She'll make you very welcome. Bet you are glad you were dragged around then!! I do recognise the chairs - and the thermos flasks! !